(transitive – inseparable) This phrasal verb is used when you want to say that someone looks like (or resembles) an older member of the family, usually their mother or father. This similarity is either of physical appearance, temperament, a habit or general characteristic of that older family member or relative. This phrasal verb is inseparable so the object can only got in the end position (after the phrasal verb). This phrasal verb is mostly used in the third-person singular (simple present). She is very pretty. She definitely takes after her mother. Your son doesn’t take after you at all. You take after your grandfather. You both have the same nose and mouth. He takes after his mother’s side of the family. Do you take after your mother or your father? 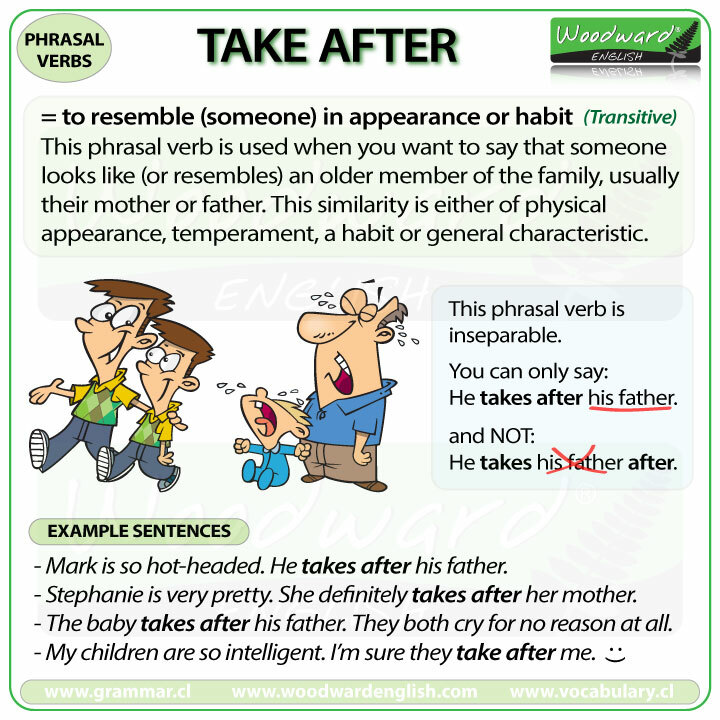 (transitive – inseparable) Take after can also mean to follow someone as an example. Again you are following a characteristic or trait of a person. You are copying their habits. Don’t take after your brother – you’ll just end up in jail like him. I hope she takes after her aunt and begins volunteering abroad.